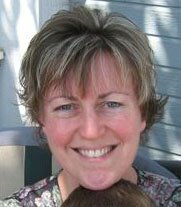 Sittin' n' Spinnin': I'm Back! What a trip! We have lots of pictures to share, too many to load here. I have uploaded most of them to Flickr, check em out! I will upload the rest tomorrow or the next day... Only 100megs a day and I have LOTS of pictures :) Beautiful scenery, sheep and the Chicago Field Museum! It was a last minute decision, and we only had about 3 hours, not near enough, but it was wonderful! It took 4 days to drive out to Wooster Ohio, the show started on Saturday and the Sale was on Sunday. There were lots of vendors (no pictures of them, sorry I was too busy shopping and forgot I had a camera :), lots of sheep and lots of people. We saw a day old cria, the momma was a newbie and wasn't quite sure what to do with the baby so the owners brought her down to make sure the cria nursed. 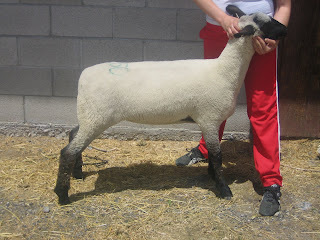 I bought the ram lamb I went after, as well as a hampshire ewe for Jari's 4-H breeding project this year. 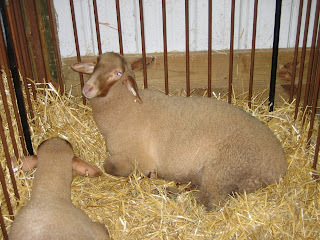 Spent way too much money but she is a very nice ewe! Glad to hear it was a good trip and you're home, safe and sound! :) Can't wait to hear all the details! And how many sheep did you buy? LOL! I was ready to come looking for you. Seemed you dropped off the earth and got lost! 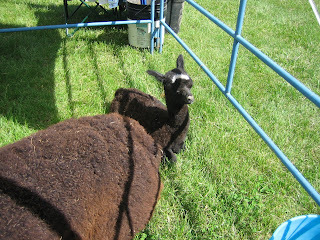 WOW that little hamp ewe is gorgeous! Becky, please send me a private email and let me know what's involved with setting up a Flickr account.